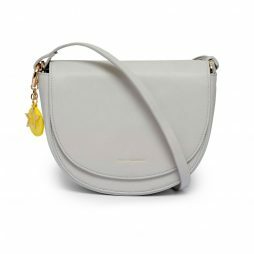 A classic everyday Loman saddle bag from Estella Bartlett in a stone. Beautifully crafted in an alternative leather that’s vegan friendly, this bag features a main compartment with a zipped inside pocket, making sure you have plenty of room to store all your daily essentials. This Estella Bartlett bag comes with an added yellow disc bag tag and golden star charm with the message ‘Enjoy the Little Things’.